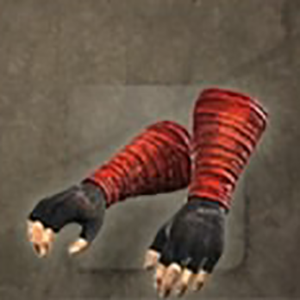 Hayabusa Shinobi Apparel: Kote is a Arm Guards in Nioh. "These gauntlets use simple hemp, wrapped tightly around the hands. The dye used contains a special extract that hardens the material to be capable of deflecting blades and projectiles without sacrificing ease of movement. They was used by the Hayabusa ninja, a proudly independent ninja clan based around a secret mountain. Much of the truth behind this secretive clan is shrouded in mystery, and only a secret few were privy to their arcane techniques. They differed from other clans in that they served no master and were motivated by profit; they were solely focus on ridding the lands of any evil that should attempt to sully it."